Low and middle-income tenants in major towns and cities, particularly in the capital, are going to be hard hit by another spell of house rent hike in January amid the indifference of the authorities to the spike in the cost of living in urban areas. The tenants, already held hostage by the rising housing cost, have been exposed to severe hardship triggered by hikes in gas, water and power prices this year. In the middle of this year, the household gas price was increased while water price was hiked a few months ago. The government recently announced a fresh power price hike effective from December. Besides, two city corporations in Dhaka have moved to hike holding tax substantially, making a steep rise in house rents more obvious in a month or two. People of some areas, including the B and C block of Khilgaon residential area of the capital, already took to the streets to protest the holding tax hike. House owners in different areas have received corporation notice about the holding tax hike. House owners and landlords every year increase rents amid silence of authorities concerned. In most cases, house owners keep arbitrary clauses in tenancy agreements to protect their interest and prevent tenants from raising their voice in case of any irregularities, said several tenants. The landlords normally increase house rents at the beginning of a year, but there is no proper law to ensure reasonable hike in house rents. Tenants have to spend a significant amount of their income on house rents, but they do not get standard amenities in most cases.Besides, most of the landlords take two-three months’ house rents in advance and in some cases, tenants have to pay advances for six months. But many house owners even do not provide any receipt to the tenants. On July 1, 2015, the High Court in a verdict directed the government to constitute a commission within six months to recommend house rents on the basis of house quality and locations. The HC order came following a writ petition filed by Human Rights and Peace for Bangladesh. But the authorities concerned are yet to comply with the HC directive although the tenants are being hard hit by indiscriminate and arbitrary house rent hike. The HC also directed the Police to take instant steps over any rent disputes in the capital and elsewhere of the country. The cabinet secretary was asked to form a high-powered seven-member rent commission within six months over the matter. The proposed commission was entrusted with making necessary recommendations for fixing standard house rent rates based on locations and updating the House Rent Control Act 1991. The court also asked the government to appoint a controller at every ward across the country for hearing and disposing of the allegations over the house rent issue until the commission is formed. The HC directed Officers-in-Charge (OCs) of all police stations to take steps so that no tenant is evicted by landlord illegally and arbitrarily. According to media reports, most of the landlords raise house rents on the eve of a new year. If any tenant refuses to pay the hiked amount, the house owners force them to vacate the house. The situation over house rent is deteriorating gradually in the absence of a proper law and lax monitoring by the authorities concerned, many city dwellers have alleged. A survey report of Consumers Association of Bangladesh (CAB) said house rents in the city on average increased by 16 percent in 2011 while Bangladesh Bureau of Statistics report shows 11 percent rise in inflation in that year. The report also says house rents in the capital have increased by 249.62 percent over the last 19 years. House rents rose by 15.83 percent in 2011 over the rates of 2010. The rent of a two-room flat in a concrete building increased by 13.27 percent, tin-shed by 14.71 percent, bachelor house by 17.39 percent and slum house by 17.95 percent in the year while the rate was 14 percent in 2006, 22 percent in 2007, 21 percent in 2008 and 15 percent in 2009. Abdul Mazid, an official of BIRDEM Hospital, said his landlord asked him to pay Tk 2,000 more from January. Many people said they cannot afford any hike in house rents which is taking place every year. Kabita, a housewife in Tongi, said, “My husband lost his job as an engineer. My son is a student of IR Department at Dhaka University. One of my daughters is a BBA student at a private university while another daughter attends a college. How can we survive with such hikes in house rents and commodity prices? ” she laments. Advocate Manzill Murshid, president and counsel of Human Rights and Peace for Bangladesh (HRPB), told the daily sun that he will receive a certified copy of the HC verdict on house rents soon. “We will take next steps after collecting the certified copy of the HC verdict,” he added. 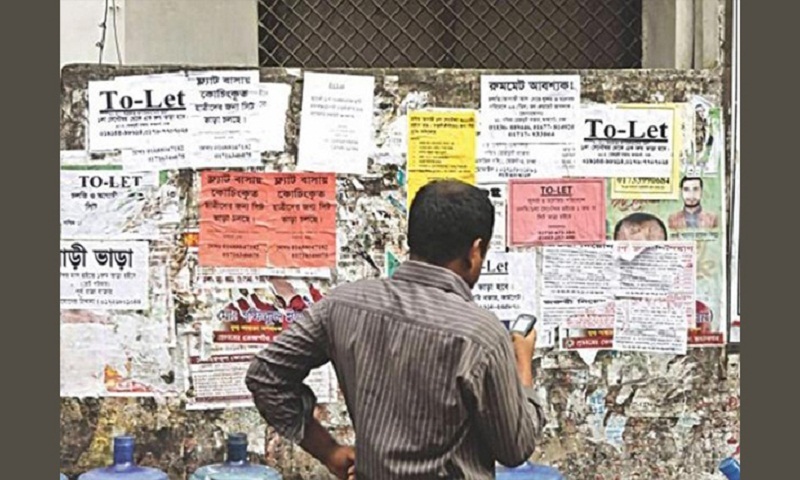 Md Baharine Sultan Bahar, president of Rental Council, said the city corporations in Dhaka are planning to hike holding tax from Tk 8,000 to Tk 72,000. The government has recently announced another hike in power tariff, which will affect house rents. “Though the HC had issued the directive long ago, the government is yet to constitute the house rent commission,” he said. Low-income people have been hit hard by the spike in living cost caused by the implementation of the 9th wage board for the public servants, he added.